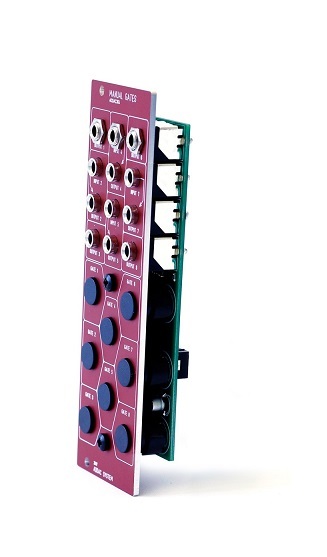 MUFF WIGGLER :: View topic - Super excited about the ADDAC manual gates modules! 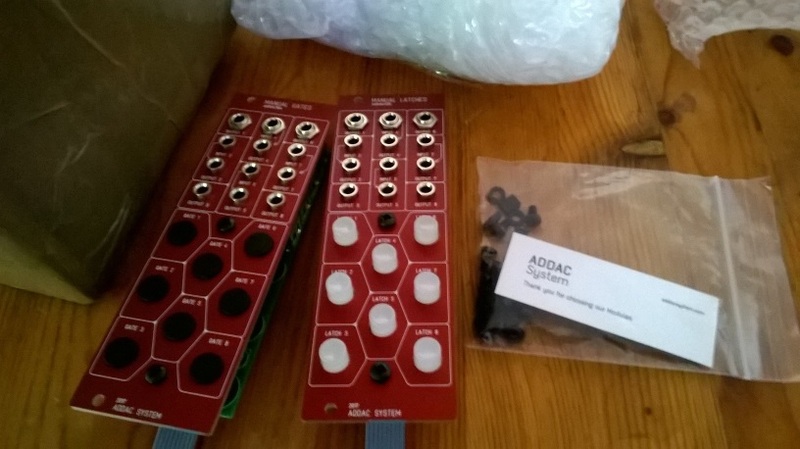 Super excited about the ADDAC manual gates modules! I'll report back as soon as I get the module in my hands. Just wondering why these are two distinct models, rather than one model with a switch to toggle beteeen gate and latch modes? This is just a guess, but for usability I'd probably want momentary and latched buttons to feel different. Interacting with latched, I'm expecting a click and light feedback. Interacting with momentary, I expect a stiffer more responsive button. Don't know if that's how they did it, but that'd make sense. I like the feel of the momentary switches that ADDAC uses - enough so that I got super excited with the prospect of having 8 in a module to play with on the fly. Their latched switches are different on the 305 (see further below for pictures from the site). From what I've seen so far ADDAC usually get their toggle functionality in the digital domain (from the top of my head ADDAC206, ADDAC207), but these pair of modules are cheap and simple, so at least to me it makes sense that they went with two distinct designs. I actually agree with anosou, when performing I'd like the haptic distinction from the different types of buttons. I totally forgot to post this here! Really satisfied by these so far. The ADDAC304 rightfully replaced my doepfer a-164-1 on my live case by being nicer to the touch and with more outs and ins. Can't have enough of those! I just shot a message to ADDAC, but thought I’d ask here too. Is it possible to use the Manual modules mute i/o out module? I’d like to send it drums and chop up the signals into the DAW. I imagine it is because these are used mechanically and not electronically. What I mean is that there is barely any circuitry involved except voltage division down from the power supply. The voltages are not being controlled through another circuit, they are actually passing through the switches themselves. This makes a much cheaper unit to make, and the switch determines the function. We had many request to make the MG-1 Manual Pushbutton module we make in a toggle version. We could not because the Arcade switch we used did not come in a toggle version. We ended up making the FSR-1T to cover that function, an electronic switch that could be made toggle or momentary. It included much more circuitry than the MG-1 because of that. If,I understand your question correctly you want to pass audio and use the button to mute/unmute it? I don't see why it wouldn't work! I've been using mine for CV but the module is very simple, so I presume it would work with anything. Don't forget that it's not a passive module so you don't get any drop in signal intensity; if you want your signal to go to a DAW you'll need to attenuate it. Those white buttons look like they light up? That's another reason they would be different. I just pull/push plugs for now but I can see the usefulness of these! After several weeks of hunting for mute/switch/mixer modules (check out my modulargird) I decided on Animodule’s M1xXOR because of its functions and small HP size. It’s a mixer, sequencer, OR gate, module, with gate over the mute buttons, and additional attenuators for each channel. Definitely the UGGLIEST out of the bunch with the screen printed by hand panel and dense layout, but it’s the most available module to me at the moment. The other mute modules on my mod rack are either prototypes announced last NAMM, discontinued, or pricey to ship to the States. I’m looking forward to SSF’S Muton, which will hopefully be released later this year if I don’t dig the M1xXOR. Those white buttons look like they light up? Yes, buttons on the Latch module (ADDAC305) light up!! I just finished the 304 DIY and works perfectly. The 'momentary' switches feature on Four of the outputs is pretty sweet. I'll try and build the 305 next and report! 304 is my first ADDAC module. Really impressive build quality and aesthetic. I wondered if there's some of you that have the 304 that can answer this question. Is there any limit on the speed of the gate on/off other than my ability to mash the buttons and do audio pass nicely through the module? no it sends a gate not cv, but you can trigger an envelope with it if you want a smooth curve.. I never noticed anything and I've been mashing them a lot! Received my 304 this week. Incredibly useful module, using it to transpose, trigger drums and modulate stuff. perfect match with tyme sefari with SoT. Buttons are very playable for such a small size, love the layout. Thanks for posting this, these are exactly what I’ve been looking for!